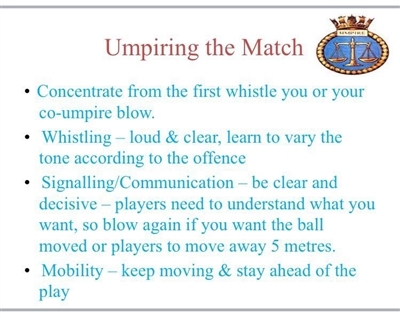 Engaged Mentor (blowing the whistle) – are required to umpire the fixture, with the learner umpire no further than 1 metre away, ‘shadowing’ them. 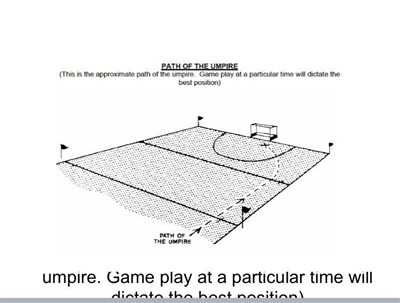 Disengaged Mentor (not blowing the whistle) – are present to ‘shadow’ the learner umpire no further than 1 metre away, while the learner umpire officiates the match. Only ONE person will be responsible for blowing a whistle during the fixture. 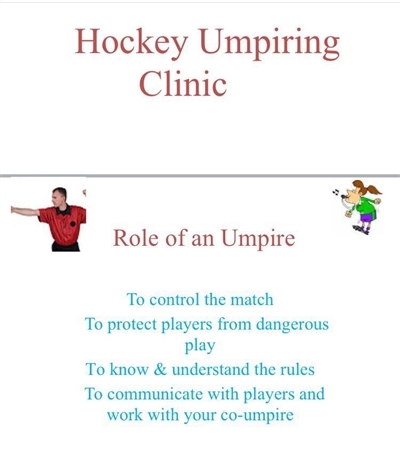 On-field mentors assist the learner umpires by showing them positioning, signalling, explaining rules where necessary, prompting decision making, areas of control, teaching them all facets of umpiring. 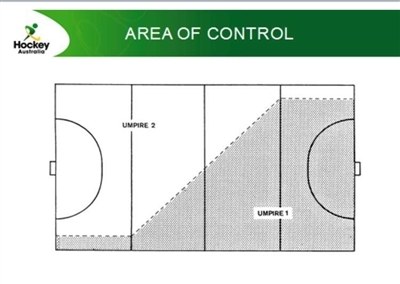 ON-FIELD Umpire Mentors are allowed on all divisions up to and including Division 4, JT2 and MM2. ON-FIELD Umpire Mentors are NOT allowed on Division 1, 2, 3, JT1 and MM1 – at any time. An off-field mentor accompanies the learner umpire to pre-match duties (e.g. coin toss) and then observes the learner umpire from the side line during the fixture. The off-field mentor takes notes and approaches the learner umpire at half time and full time to discuss their observation. 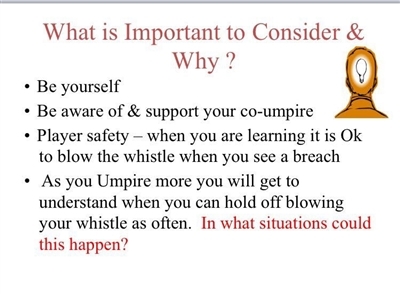 Off-field mentors are NOT responsible for blowing a whistle during the fixture. An off-field mentor should not enter the field of play except in extra-ordinary circumstances. 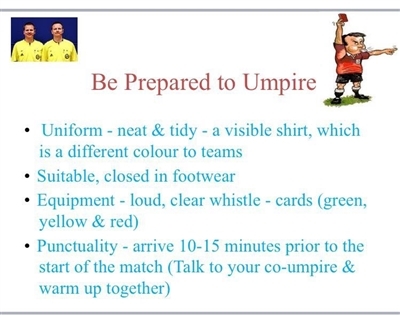 Circumstances where it would be appropriate for the off-field mentor to step onto the field may include an increased risk of danger to the players (losing control of the match) or umpire (behaviour management of players). 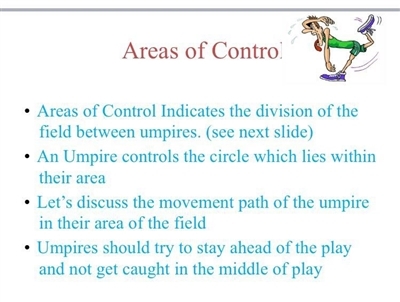 OFF-FIELD Umpire Mentors are allowed on all divisions. In line with the directive from Hockey Australia and Hockey Queensland, all teams competing in the BWHA fixture competitions from U13 to Division 1 and Masters will be playing the following rule. 9.7 Players may stop, receive and deflect or play the ball in a controlled manner in any part of the field when the ball is at any height including above the shoulder unless this is dangerous or leads to danger. This rule will not be played in the U11, U9 and U7 competitions, sticks must be used below the shoulder height in these competitions. Tomahawks are a legitimate skill and are allowed in ALL DIVISIONS of BWHA hockey. The Tomahawk is a skill to be learnt, but poor execution that leads to dangerous play – must be blown, especially in Juniors. Clubs need to instruct their players on the skill, including how to defend it and where and when to use it (e.g. not in a crowded circle).